The island needs more housing. Approval of major construction projects, new hotels, and ocean front condos for the rich without concurrent plans to build sufficient housing for average people has driven up housing costs to near the highest in the nation. The average rent in Honolulu, including utilities etc, is roughly equal to the after-tax per capita income. High housing costs are squeezing the weakest onto the street, and all the current proposals focus on the symptoms rather than addressing the root causes. "Mayor Kirk Caldwell, a Democrat.......?". As the difference between Repubs and Dems keeps getting, getting smaller and smaller, Mayor Caldwell states, “It’s time to declare a war on homelessness." Great. Declaring yet another war is all we need. What is the point of paradise if we declare war when we should be declaring peace? If this is Hawaiian compassion, I guess I don't need to include Hawaii on my bucket list. I almost never read comments attached to newspaper articles, but this New York Times article was so much Caldwell Kool-Aid that I thought I would see if there was any sane reaction to it. There was. See: New York Times, Honolulu Shores Up Tourism With Crackdown on Homeless, 6/22/2014. Sadly, it’s a pretty shallow job of reporting. This from the same guy that is behind a $142 million sale of 12 affordable housing buildings in downtown Honolulu... to a private developer. 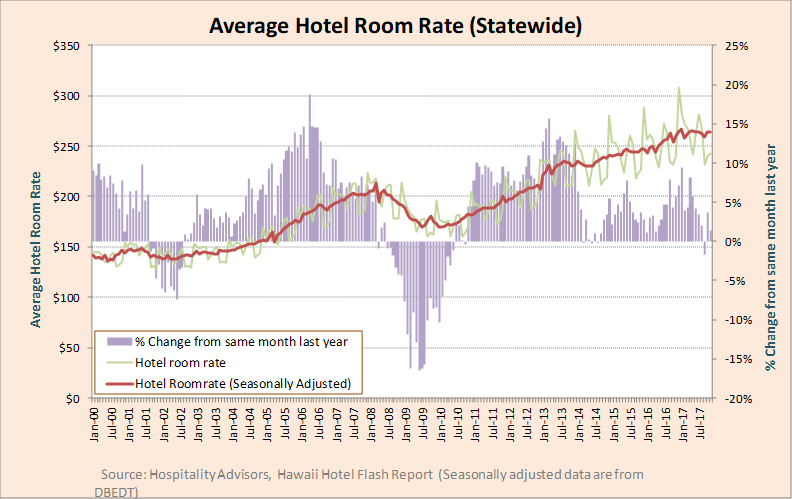 Hawai'i Hotel Room Rates: Circa 20% ABOVE avg. pre-crisis rates. "many of the homeless are people who were drawn here from the mainland." 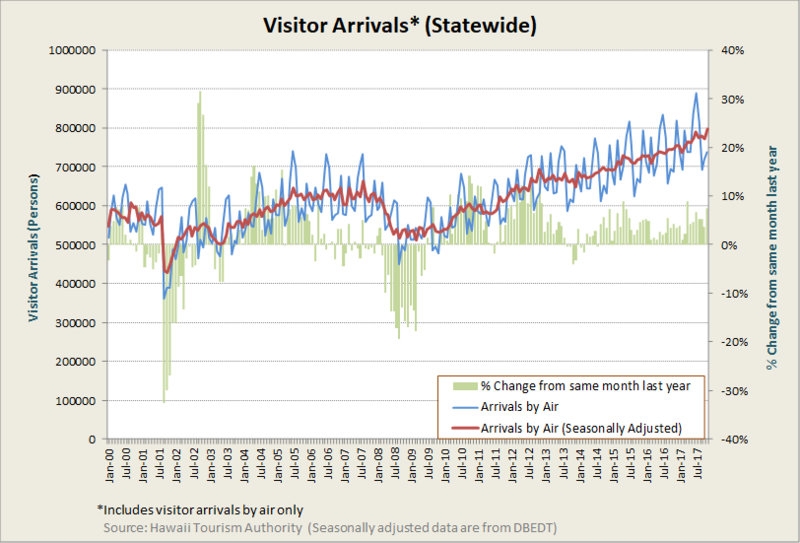 What is not said; an enormous number of the homeless are Hawaiian. This is an issue that is far from exclusive to downtown or Waikiki. The quoted number of 6,335 homeless is waaaaaay understated. It's funny, most local people discuss homelessness expressing concern for the actual people and our root causes. Silly really. We should have just been concerned about the "visual impact." So, who exactly are your constituents Mr. Mayor? Tourists certainly can't vote for you. Are there maybe other constituents that have "interests" in Waikiki and/or downtown? Mr Mayor, on a $ weighted basis, exactly what % of corporations in Waikiki are Hawai'i domiciled? National aspirations or just funding concerns? I do think it’s fair, though, to be concerned that the out-of-control development boom combined with inaction to the growing poverty level (as evidenced by the number of people living on the streets) could impact tourism in the future. A “war on homelessness” fought in public view in Waikiki could, in fact, trigger negative articles about Hawaii. Then the downward spiral begins. The commenters are probably a cross-section of some sort of NY Times readers, and while some are trolls, some are perceptive. The trolls won’t come here anyway. Those with compassion may begin to avoid Hawaii. They google before they leave, they’ll read about the City’s raids and police actions. Unless the City and State take effective action to reduce the causes of poverty, implement Housing First and other evidence-based programs, and take measures to keep people already housed in their homes, it will be our government leaders that will be responsible for any falloff of our tourist-based economy. Some of the comments make that perfectly clear. As to the tourist industry itself, some of those hotel owners might pull out their checkbooks and begin contributing to the solution. If they can afford to construct giant towers, they can also afford to build some Housing First units, wouldn’t you think?